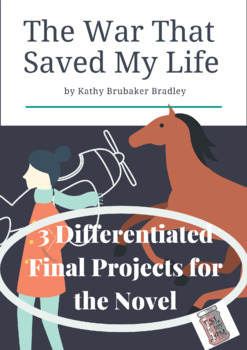 Included are three different final projects for use after reading the novel The War that Saved My Life by Kimberly Brubaker Bradley. The projects are designed as a culminating activity post-reading. One or all projects could be used by a class. 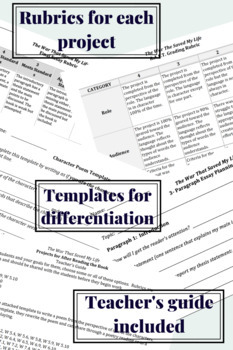 They are differentiated- select the appropriate project for your students. 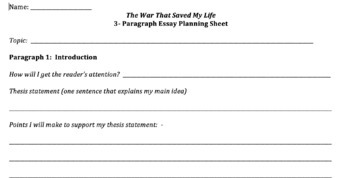 Each project has a template(s), a teacher's guide, and a scoring rubric. In addition to this product, activities for the full novel are available as a unit is available! Buy the unit and save over 25%! 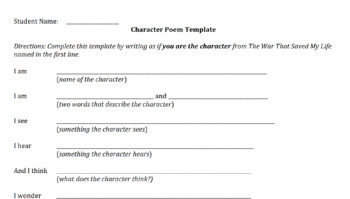 *Note: Standards vary based on which activity is used and with which grade level. All targeted standards are included in the product.